to conduct the first FIFA/OFC Club Licensing for Tonga in the home of football, Loto-Tonga. The FIFA Club Licensing system is only one of many development programmes that are run by the governing body. The FIFA Club Licensing principles form the basis for the confederations’ own club licensing principles, taking into account the regional specificity of club football. auditing of finances and greater transparency of ownership. The FIFA Club Licensing system requires club to commit to minimums standards and principles in five key areas. “We had a very successful day today, it was great to see so much partnership between the clubs and the Tonga FA and her executive committee members. and for football in Tonga,’’ said Kemp. ‘’ The sporting criteria under the five pillars make it clear that clubs must have a qualified coaches, and it is under our coach development and player development curriculum,’’ Uele added. 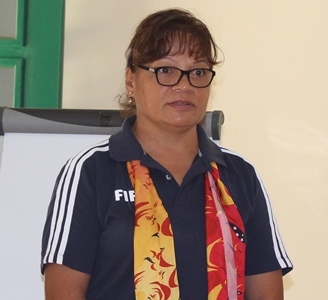 The 2 days workshop was opened this morning by Lady Robyn Tu’ivakano, Madam Chair of Women’s Football.